Coaxoch was gathering herbs in a part of the forest she had never seen before. It was darker, where sun patches were rare and the light came from strange glowing moss. But it was full of the scarce Jupiter Strike, a strong anti-bacterial. Her basket and jaws were full of it when she sensed something behind her. She whirled around dropping the Strike in her mouth and let out a fierce growl. But there was nothing there. "What is wrong with this place?" she asked herself, gathering up the herb. Avian dusts off his chest, covered in dirt and mud from the fall and landing near the river. He caught sight of something hiding behind the trees. I have an idea in mind, I want to share it with you so you can understand better what is going on and know how to reply, but of course things can change! A young brindle purple dragon had senced the odd danger..... the presence of whatever the creature was... made Shadowcast shiver a bit, he ran a few meters before tripping down a hill and landing on the ground back first next to a firewing, "...Avian's your name right?" the purple brindle dragon got up onto his haunches and looked over to the white dragon... "I dont really like this place... do you think we can get out?" the dark forest was clearly distressing him.... so was the sudden audible sound of the creature. Avian blinked a few times in confusion and stood up again with two legs, but sudden grabbed the IceWing after taking the dragon's words into quick consideration, running behind the Vegetation and joining the white dragon. "Okay! What's coming?!" he quickly asked her with haste and he placed the IceWing down. "Also, what are you guys doing here? Is this place even safe?" Avian was concerned, and honestly, a bit creep'd out, since suddenly he was just warned out of the blue that something dangerous was coming his way. Sleenia was surprised to see the new dragon, and how Avian, as she heard the other one call him, took him and came next to her. Avian tried to object to her words asking them to leave. The sudden roar stopped him, as he lowered his head and covered his ears with his forepaws, closing his eyes. He turned to the source, and caught sight of the creature's silhouette through the darkness. "That.... is it that 'thing' there.. what you need to purify...?" Avian was in slight shock and disbelief, but it wasn't uncommon for beast like those to appear as it should be no surprise. "If it is...." he paused, with a light tone of voice, "I'll help you..." Avian turned to the IceWing. "As for you, fly away when I- or we, make an opening... If you want, you should too, miss." he looked at Sleenia. "This isn't good..." he muttered to himself and shook his head, staring at the broken tree on the ground. Avian clenched his claws, both on his forepaws and hindlegs, "Okay, so, what do we do?" Avian's instinct told him that the creature wasn't going to be easy to bring down, not without an EarthWing or fellow FireWing, he thought. She smirked when he proposed her to fly away "if you do not leave I'll do the same sir" she replied, admiring the bravery he showed, she was gratefull and now was feeling stronger with him by her side. "Ah- Hey!" Avian was startled at Sleenia's sudden move in an attempt to draw the creature's attention, despite that she had said that she would. It was a bit to fast for him to react, as watched at her agility while she successful evaded the attacks of the beast. He quickly leaped out of the cover, running on all 4 legs towards the beast as it was temporarily blinded by the light Sleenia had made. When in close proximity, he lifted up his forearms and ran on his two hind legs, using his right shoulder guard of his armor, he rammed into the beast's head with great force to stun it upon impact and knock it down. After the impact, he slid forward on his feet, and stabbed his paw with it's claws extended into the ground, coming to a quick stop. "Okay! That should do it! What now?" he turned his attention quickly away from the beast and looked to Sleenia, breathing heavily as adrenaline rushed through his blood. Sleenia was amazed by the force and bravery showed by Avian, she looked back at him but had no time to talk because the beast, that just a second ago looked to be inconscious, suddenly opened his red eyes and growled, reacting by moving its arms to stand up, it moved fast slashing Sleenia with long claws similiar to a bear's one, Sleenia was totally caught by surprise and had no time to completely evade the attack, despite her agility. After this she moved her eyes in the direction of the one that was her "partner" in this bad situation, giving a worried look, and summoned again her power making a kind of transparent shield that made the air trembling to confuse the beast and protect them "your attack was great but I'm afraid we have to do more that this to neutralize this monster!" she roared outloud at Avian, now with a more determined light in her eyes. Sleenia took a deep breath preparing to summon pure energy from her body and use it against it, it was not easy to keep alive both the shield and the energy for the direct attack "we need to find a weak point, let's see if this will show us something..." she said, hoping and thinking that maybe a pure source could make it reveal more that what it's visible at the eye, or make it react and show its power and energy, because this could also work as a provocation. Kokoro, from way up high in the sky, noticed a bright and shining light from the land below. A bit curious, she descended to the ground and as she became closer to the Earth, roars of a large beast startled her. The light quickly faded from sight though as Koko hovered over where she last thought it appeared. She then looked closely among the tree's wondering where that light went. Everything seemed like it was never disturbed, until she landed onto the ground. The beautiful scenery had vanished, the forest was as gloomy as ever and the lighting has dimmed a great amount that it could easily been mistaken for night. "W-what? B-but I thought...How...?" Kokoro was speechless. This was quite the dramatic change from what she was used to seeing. Cosmos sat in the middle of a thick, damp, and muddy forest. His horizons were large compared to others, he had his eyelids covered in thick layers of mud and other material that had potential of closing and healing wounds. He then sighed, "It's a nice day, why not enjoy myself? Consider yourself,..hmm, undercover Cosmos. Yeah, when someone needs help, I'll be there.." He said with a half smile. He spewed acid onto the ground, not enough to burn him but enough to heat it up. Though it'd more or less burn through other dragon's skin. He curled up on top of the acidic mud, and after a few minutes, he was perfectly camouflaged and covered in acidic mud and other material. His body was spread across half of the forest itself. It would more then likely other dragons would trip over his tails or other limbs. The sun was beaming right down on his head, and his scales blended in, and large amounts of dust coming out of his nostril with each breath of exhaling, Cosmos could hear everything around him, his tiny ears perking in several directions. He listened for the slightest sound of danger. Soon he was half asleep, drooling acid and exhaling dust. The massive, and we mean massive brute stayed alert, but continued to enjoy himself. Kokoro tilted her head at the familiar shriek, and she couldnt help but feel pain at the sound itself. The roar seemed to come from her right, but then again what if it was left? Or even coming from behind or forward? Koko hadnt the slightest clue, but with the pain she felt from that awful sound, she decided to just go straight. No matter what lied ahead. Plenty of minutes now past, and Koko slowly losing hope on getting out of here or finding that familiar screech. Walking any further seemed worthless as well. But suddenly, just out of the blue, the earth around her shook with such a force, she tipped over. "Geez, what kind of monster thinks shaking the whole world is so exciting..." Kokoro muttered and stood back up, "Hmm, instead of walking, why dont I just fly? Idiot..." She scolded herself, and lifted off the ground. Right as she got to the same level as the leaves, Koko bumped her head on some branches, "Ow! What the...?" She glanced up and frowned as she saw endless amounts of leaves and branches, "Uh? But I thought I just saw parts of the sky...Gahhh! Dumb ol' mind, making things up for me to goof..."
Kokoro came back down onto the ground and shook her head crazily, "...Where are you strange familiar sounds!!!!" Her voice continued throughout the forest. Avian dropped his head to the ground and covered his ears with his front paws like an animal, the noise was painful, and the energy that was emitted amplified the pain. As Sleenia highlighted the creature's weakspot, Avian rose his head with his teeth clenched and with an angry expression on his face. As the attacking tendrils(tentacles actually ) smashed through the ground and destroyed the environment while releasing the toxic gas, Avian was paralyzed for a while, as he had never had to maneuver in combat quick enough. For Avian, time froze, as Sleenia magnificently dodged the attacks faster than he could realize, not noticing she was hit several times. But as she fell down in pain, Avian's heart stopped, and was beating slowly as he feared of someone dying once again due to his incompetence. Avian felt like a flame was burn in him, and with every thought of the battle, it became more fierce. Without thinking Avian rushed forward to the beast, ramming into it with his head, with enough kinetic energy that even his scales around his head were shattered, but it was enough to knock the monster down for a good time. "Nevermind that! I'll try to keep it stunned! You concentrate on healing yourself for now." Avian quickly shouted out to Sleenia while he rushed towards the beast, with his claws engulfed in the essence of fire, leaving trails of flame on the ground as hit feet hits the ground. A trickle of blood began to run down to his snout from his forehead and separate at his snout, rushing down his face and dripping from both sides of it, as he swiped three time at the terrible beast on his hindlegs clawing through it's hide, but not very effectively, leaving burning scars to hinder the creature. Avian dropped back down on all his feet and tried to keep the creature at bay, firing his flamethrowing breath it, but not with the use of the natural gas that dragons ignite to breath fire, but it was fueled by magic, super heating and lighting the oxygen on fire. The creature was complete covered in flames, but it was unclear when ever or not the beast would be held back by the fire. "I have to keep her, that's my main priority of my actions in this fight." Avian thought to himself. Without Sleenia, defeating the creature would beyond him in his current state. She was needed to be kept in good condition, as he feared the death of others more than his own. The trees swayed and shook, and the branches slapped each other as a racing object sped through the forest, galloping at speeds much faster then normal for her race. Her beautiful white body sparkled in the sunlight, despite being in the jungle where few things could be seen through the heavy underbrush. The crystals on her back sliced through the vines like they were paper. Her eyes were wide as she continued to run, unaware that she was heading in the same direction as the creature that Sleenia and Avian were fighting, nor was she aware that it was a very heated battle. At the moment the only thing she was focused on was getting out of this crowded forest. For she was a bit claustrophobic and could not stand being in crowded places. Suddenly, she burst forward into the clearing where the two were. She would have smiled, had it not been for the giant creature attacking them. 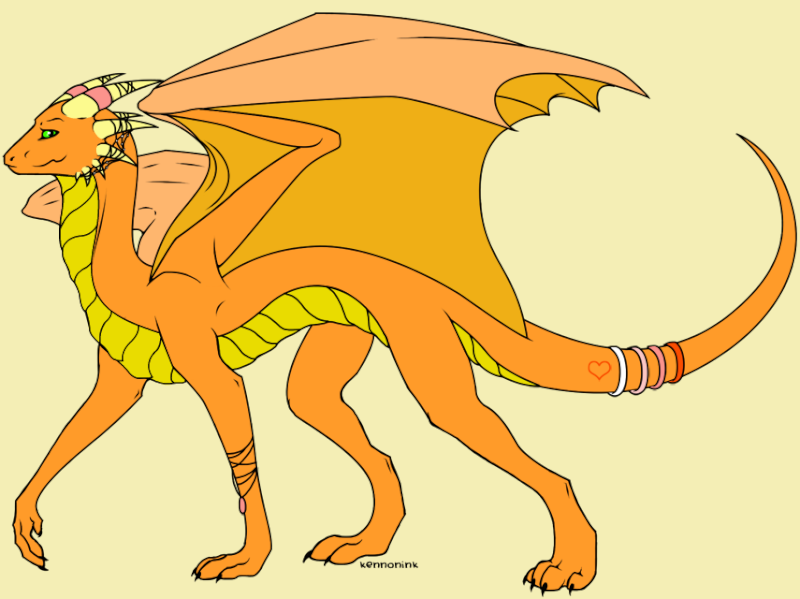 Snarling in fright, she suddenly reared up on her hindlegs, trying to stop herself, and flashing her wings up suddenly. The sun reflected off of them, making anyone who stared directly at them temporarily blind thanks to all the colors that were reflected in the membrane. *sleenia looked at Avian and was amazed by his courage and bravery, she was worried for him, she didn't know if there coul be consequences for him if he was touching the damned beast, also a bad thought crossed her mind and made her shiver inside, because she was thinking that probably there are more infected beasts like this, more or less, and they still didn't found the font. Frightened by the strange, alien-like beast that was attacking Sleenia and Avian, Trinyah took a hesitant step backwards, shaking as she witnessed the beast throwing its tendrils over at Sleenia and Avian, scratching at them. Of course the small dragoness wanted to help, but what was she suppose to do? Her attacks couldn't possibly work against a monster as large as that! Though this was just her thinking, for Trinyah had no idea the power she held through her attacks, that were such a unique part of her it was really a crime not to use them. Yes, the little dragoness wanted to help, but she just wasn't sure where she should start! Scared for the others, herself, and the tainted creature, Trinyah lowered herself to her belly, casually creeping over to where Sleenia was. Because the large light dragoness was bigger then Trinyah was, and because the grass was high, no one would notice the little one right now. That was, until a poisoned tendril slapped through the air and smacked into Trinyah's side, making her yelp in pain and jump into the air, attracting attention to herself. When the creature stared over at her, she froze in panic, unsure of what to do or how to fight back. Her body trembled when she stared into the dead eyes of the beast. Luckily, she had distracted it from Sleenia and Avian for the time being, but who knows how long. A familiar scream yell through the air, despite Avian has not heard it, he recognized the tone... "Trinyah..." he uttered lightly to himself, as he looked to the beast as it was recovering from being stunned. He wasn't going to let the beast get even a small chance to attack, so he had to remember what he learned from his home, in battle, in war, and in near death. He smashes his left legs on the ground, causing the ground underneath the beast to collapse, or more so it 'caved in' on itself. Avian inhaled, and raised his hands into the sky, struggling to stand on his two legs as he wasn't naturally a bipedal creature. Nothing was above it, but his hands were in the air as if he was lifting something. He swung his hands down, as a heavy shock could be felt deeply in the land. The soil came alive, earth and rock burst through the earth like an inverted land slide, creating a stony prison for it, the only thing was a small hole on top of it, where Avian flew to and inhaled only to blast a large amount of flames into the prison. Fire wouldn't kill it, but it would even enrage it, he thought, but it was meant to incapacitate the creature. When he was done, he dropped down the ground, hastily looking over the lands until he spotted Trinyah. He rushed over to her, stopped close to her. "Trinyah! Get out of here! Go somewhere safe!" he used his snout to raise her up to get her back on her feet, as shouted out on her to get a move on. "Sleenia! You too! Just go! I'll follow you two in a while!" he turned and shouted to Sleenia too. It was getting dangerous and their wounds needed to be treated, otherwise defeating the beast now would meaning sacrificing them, that would be one of the last things they needed. As he attempted to get Trinyah back up on her feet, the rock prison began to shake, collapsing piece by piece from the force inside, and would soon lose it's strength and break down, letting the beast free and rampaging again.